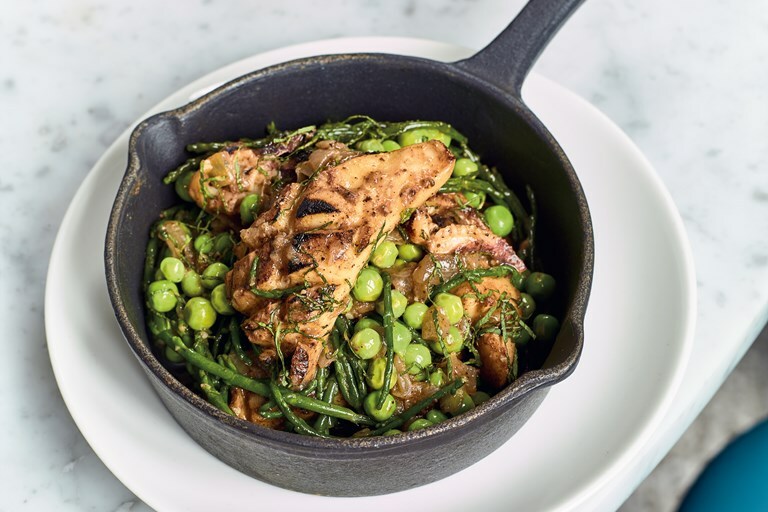 This fresh, summery cuttlefish recipe from Selina Kiazim makes the best of this under-used mollusc, quickly pan-fried with baharat, a Turkish spice blend including allspice and nutmeg. You can make the blend yourself or buy it premade from a Turkish supermarket if preferred. This recipe is taken from Oklava by Selin Kiazim, published by Mitchell Beazley. Photography by Chris Terry. Just after finishing college, a few of my friends and I went to Spain for a celebratory trip to visit a friend whose family own a campsite. One evening, my friend’s mum cooked us a selection of dishes, including sepia, or cuttlefish. At the time I had no idea what sepia was and she couldn’t really explain it to me, but she did say that she had cooked it with peas and cinnamon. It was so yummy that I made a note of it. It wasn’t until years and years later that I referred back to that notebook and, knowing more about food at this point, realised it was cuttlefish. So here is my version of that dish. Selin Kiazim is Chef Director of Oklava in Old street, London, the acclaimed restaurant celebrating the chef's Turkish-Cypriot heritage.